6/15/2012Share this story on Facebook! 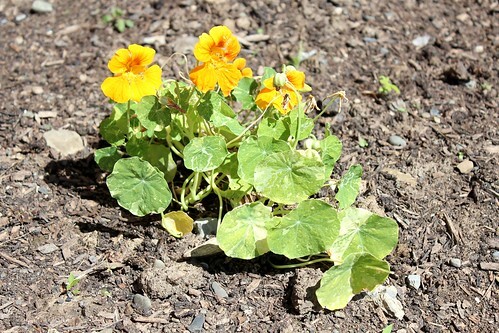 Find out what's in bloom and keep up with the Ithaca College Permaculture Garden during the summer and fall seasons. 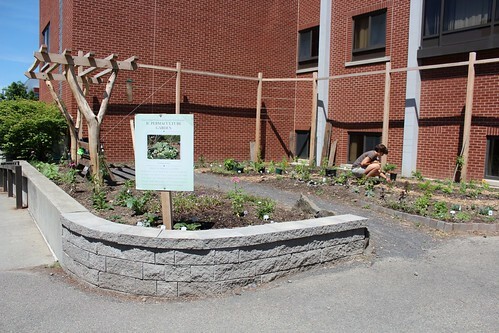 What was once an unkempt, patchy piece of grass outside of Williams Hall is now a fully sustainable permaculture garden — full of fresh herbs, colorful plants, and leafy vegetables. For Madison Vander Hill '13 it represents the result of spending a lot of time here during Ithaca's bright summer days as the garden's intern, watering and tending the plants for the season. Though the word "permaculture" has several meanings, Vander Hill says the new garden was designed to create a space that is renewable and efficient. "In food production and in all things really, humans tend to alter the land in some way," Vander Hill explains. "The exciting thing about permaculture to me is that it's so design-based. It's gardening with intention. We think very hard and specifically about the ecological consequences and what we're doing and how to make it aesthetically pleasing and sustainable — not just in the environmental sense but for the people who use it too." For IC's latest landscape addition, that means planting perennial flowers and herbs that have multiple purposes, attract insects and birds that are beneficial to the local environment, and is low on maintenance for the garden's caretakers. For a group project during her freshman Principles and Practices for Sustainability class, Vander Hill helped develop an idea to repurpose the unused space outside Williams Hall as a garden. The environmental science department has made strides over the past two years to make the project a reality, and lecturer Karryn Olson-Ramanujan further developed the permaculture design and led the initial planning efforts. Throughout the spring semester, Vander Hill and the rest of an environmental science student research team was hard at work prepping the space for major improvements, clearing the old grass, laying the soil and compost, and building a pergola, trellises, and bench. Now, the garden is beginning to bloom with everything from sage, mint, and cilantro to fennel, tarragon, and anise hyssop. Hardy kiwis, a smaller version of traditional kiwis but without fuzz, are growing near the back of the garden and with time will likely climb up the trellises and create a lush, green atmosphere. Soon, leaves will sprout on the Asian pear tree, which has three kinds of pears rooted on one tree. Besides their visual appeal, most of the plants can also be utilized for culinary or medicinal purposes too, Vander Hill explains. The garden's echinacea is a type of coneflower with bright, purple leaves and can be used to bolster the immune system. Eventually, Vander Hill hopes professors and students can use the new garden for design, botany, or sustainable agriculture workshops, similar to the lessons that the IC Community Garden hosts throughout the year. "It makes for it a really exciting educational opportunity," she says. "In a lot of ways this is like a demonstration garden right in the middle of campus." 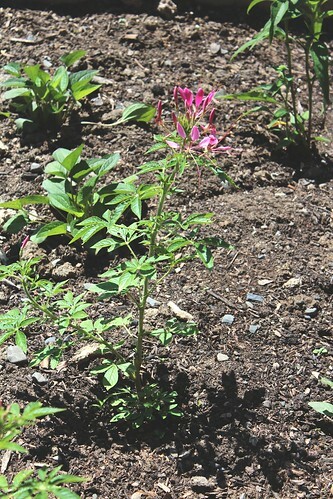 Though it's easy to find dashes of yellow and pink throughout the space now, the garden will really burst with color and new life when students return to campus for the start of the school year. "I hear in conversations when people walk by, 'Oh, it looks just like my garden at home,'" Vander Hill says. "It's such a conversation starter. Just a change like that is really exciting to see, and I can't wait to see what it looks like in the fall."